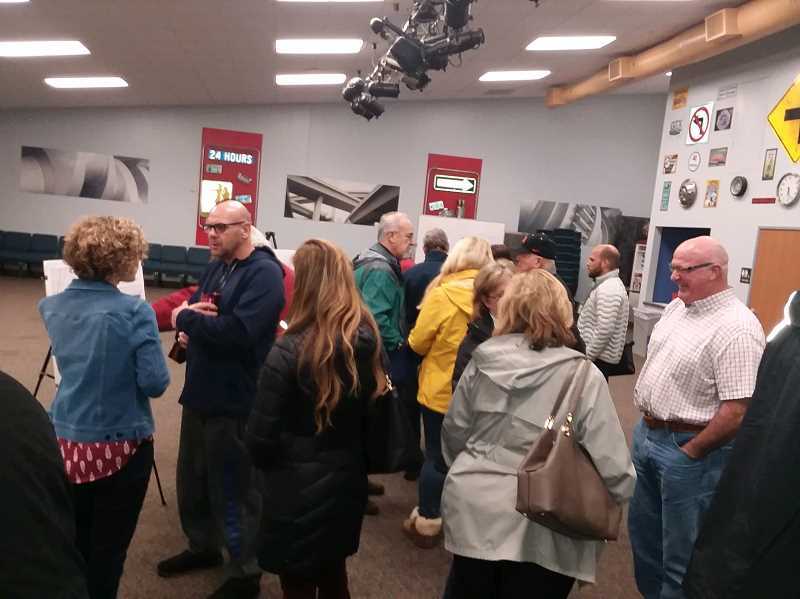 More than 30 people showed up for an open house Tuesday to ask questions or view updates on where the City of Tualatin is regarding plans for the future Basalt Creek area of the city. In August, the Tualatin City Council approved a concept plan for 847 acres of land, property the cities of Tualatin and Wilsonville have been working on for several years to determine how the land will be developed through a joint planning process. Among the issues over that time have been how to best develop 42 acres of property in the so-called central subarea of Basalt Creek, a rugged piece of topography just south of the Victoria Gardens subdivision, north of basalt Creek Parkway and east of Grahams Ferry Road. Tualatin pushed to have the area designated for residential development, saying the city was in need of more residential property and sided with some neighbors of Victoria Gardens who have worried that about having manufacturing property so close to their homes. Wilsonville had meanwhile asked that the land be set aside for industrial use with Metro, the regional government, stepping in and siding with Wilsonville in July. Now, with both cities already having approved concept plans – setting jurisdictional boundaries, addressing transportation issues and determining how utilities will be set up -- Tualatin is in process of amending its zoning map and development code along with updating its transportation system plan. Those comprehensive code amendments will likely be adopted by the City Council at the end of April, according to Aquilla Hurd-Ravich, the city's community development director. 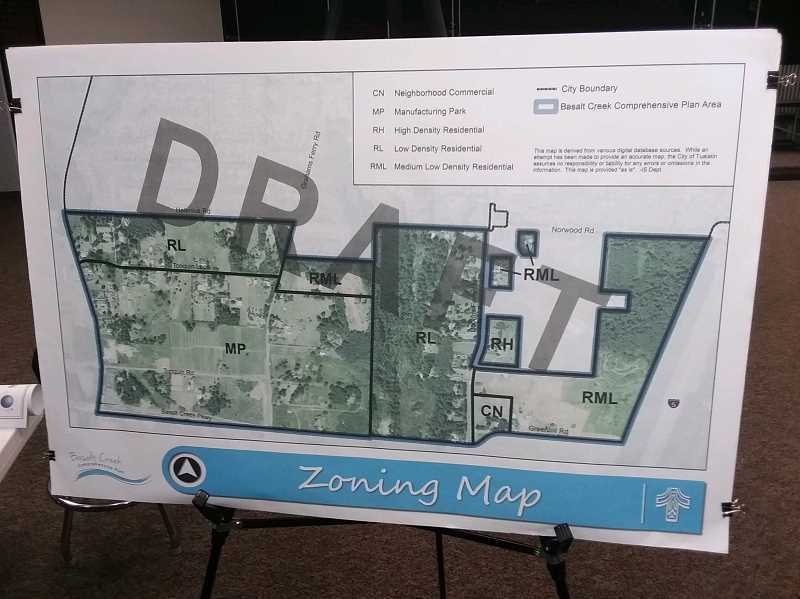 The city must also finalize an urban planning agreement with Washington County before it can begin accepting annexation requests from those property owners who want to bring their property into city limits for development. In the end, the Basalt Creek Planning Area includes 194 developable acres for the City of Tualatin and 137 acres for Wilsonville. Plans for residential development in that area include 575 households built on Tualatin property with Wilsonville having only six households constructed. For Tualatin, the breakdown is as follows in number of households: High-density residential, 67; medium-low density residential, 374; and low-density residential, 134. Paul Morrison, a Tualatin City Council member who was at the Tuesday night meeting, said he was pleased with the number of interested residents and property owners who showed up at the meeting. Although he voted in August to adopt the concept plan, Morrison and other councilors had been big supporters of having more residential development available especially in light of the massive housing needs Metro has predicted needed in the upcoming years, he said. Despite moving forward with plans for Basalt Creek, there are still concerns about the future of the area. Among those, said Council President Joelle Davis, are preserving the natural area of Basalt Creek Canyon. "How is that going to be protected?" asked Davis, who worries about impacts of a future Washington County-built road bridge that will eventually cross Basalt Creek Canyon as it connects Grahams Ferry Road to Boone's Ferry Road. Davis said among her concerns are how to protect the riparian areas in general with concerns about the impacts of salt or other chemicals used as deicers that will be applied to the future bridge as well as safety issues related to the rock quarry trucks expected to use the route. One person who is happy that planners and transportation officials decided on a different route is Grace Lucini who has lived near the canyon since 2006. She said initial plans were to have the bridge run through her property. "I said 'please look' and they agreed it wasn't appropriate because the grade was too steep," she said as she looked at a variety of planning maps at the open house. Meanwhile, the Basalt Creek property in Tualatin is expected to create 1,929 new jobs with the Wilsonville portion expected to bring 2,524 jobs to its portion of the property.